Review: Smooth action, easy to program, works very well, is not jerky. Met my expectations. I recommend this product: Logitech Saitek Pro Flight Yoke and Throttle Quadrant System. Review: The yoke won't pull back or push forward on the simulator. Review: This product has been reviewed many times. You know its worth it. Pros: Moderately priced. A good bargain with the throttle quadrant. Performs well. Both are programmable. deal provided me with an extra throttle quadrant, and both can now be programmed for multi-engine aircraft or airliners. Review: The table has be be flat underneath for the anchor else it won't stable as you move the yoke. The biggest issue is the null area at neutral. You have to move it farther than a real plane's yoke in order to get a response. This needs to be fixed in the Saitek line. Review: DESCENT flight simulator device. Cons: Don't have any complaints. Cons: null area is annoying. Q: If you purchase this, is it necessary to purchase rudder pedals as well? A: No, rudder pedals are not required. They are optional. The software can be set to automatically control the rudders. Q: My computer has a 64 bit operating system. Will the Saitek Pro Flight yoke and throttle quadrant system work with this system? A: Yes, this will work on both 32 bit and 64 bit Windows. Q: Would the Saitek both throttle and yoke be supported by Windows 8? A: Yes, both are fully supported on Windows 8. Q: Hello will this one work for my mac? A: It is not officially supported on the Mac by Saitek, however it does work just fine and many of our customers have reported it working. The only issues known to us are with the Saitek programming software. Q: How do both of these devices the yoke and the throttle attach to a desk? A: There are clamps included to attach it to a desk. Q: Does this product have a warranty? Where is it made? A: This has a two (2) year manufacturer warranty. Made in China. A: Yes, it is compatable with vista. Q: Will this work with Flight Simulator 2004? Q: 1. What model number is this 2. It says it only includes set-up software . . . What type of software is required to run the program? 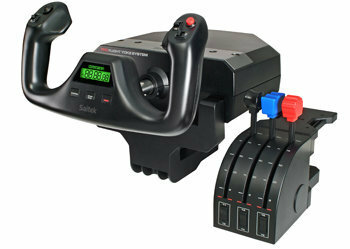 A: This is model Saitek model PZ44. The Flight Simulator software is not included but you have a variety of choices such as the Microsoft Flight Simulator X, X-Plane Flight Simulator Software, or On Top IFR Proficiency Platform. A: Yes, both the Saitek Yoke and Throttle Quadrant system and the Rudder Pedals will work with Windows XP. Q: Will this work with "Windows 7"
Q: will this work in flight simulator x ? A: Absolutely! It will work with no problem and in fact comes pre-configured with basic controls for Flight Sim X. A: It does come pre-configured for most flight simulators however you will need to spend a little time customizing if you wish to do so. Q: Can the red and blue levers be used for flaps and speed brakes and Does the Black lever already control the throttle or do you have to set it up? A: For most flight sims the black lever is preconfigured to control the throttle. All of the features/buttons/levers can be customized to perform just about any task as long as the simulator itself will allow it. Q: Does the Saitek pro flight yoke work for flight sim 2002? A: Yes, this will work with Microsoft Flight Simulator 2002. A: This controller only ships with software used to set it up. If you need additional flight simulator software it would need to be purchased separately. Q: Do the rudder pedals jack into the the yoke? Is a USB 2.0 simular in its configuration and size as that used to connect a mouse, for example? A: There are slots on the yoke to plug in additional controllers, however they would be able to interface as well by being plugged directly into the computer. USB connections are all the same, however we would not be able to say if it would be the same connection as your mouse uses (that could be either USB or serial). Q: What is this "12vdc Power Cord"? Do I need one to operate a yoke,throttle quad and rudder pedals? If so ,whats the cost? Does it need a separate power source? A: The 12 volt power cord is an optional accessory, however this system will work fine just by using the USB connection. Q: I have a Dell Demension C521 with Vista. What kind of USB(s) will I need to connect the Yoke and throttle Quad (10477A) and Rudder Pedals (10482A)to the CPU??? How many ports will it take? Would the adjustments be complicated for a semiliterate computer person? A: I am not familiar with the specifics of your computer, however you only need one USB 2.0 port to set this system up. It is very simple to get going, as you plug the throttle quadrant into the yoke and then plug the yoke into the computer. Q: wondering if I will be able to connect two throttle quadrants to the yoke USB hub as advertised or will I need additional gear? A: As long as the additional throttle quadrants have USB connections they can hook up to the Yoke's hub with no problem. It has 3 USB ports and 1 Serial port (used to connect the Saitek Throttle Quadrant that ships with the Yoke). A: This yoke comes with one USB cord to connect to your computer and one serial cord to connect the throttle quadrant to the yoke for power. The optional 12vdc power cord is not included. Q: will this yoke work on my mac book pro? A: At this time the Saitek controllers are only listed as being supported on the Windows operating systems.